The landmark 100th issue of AC’s long-running classic vintage reprint series is finally here, and WHAT an issue it is!! The ladies have hijacked the book from Page 1 to Page 160, with this issue’s special theme on ALL the comic bok masked and super heroines that existed in comic books BEFORE DC’s heralded WONDER WOMAN! 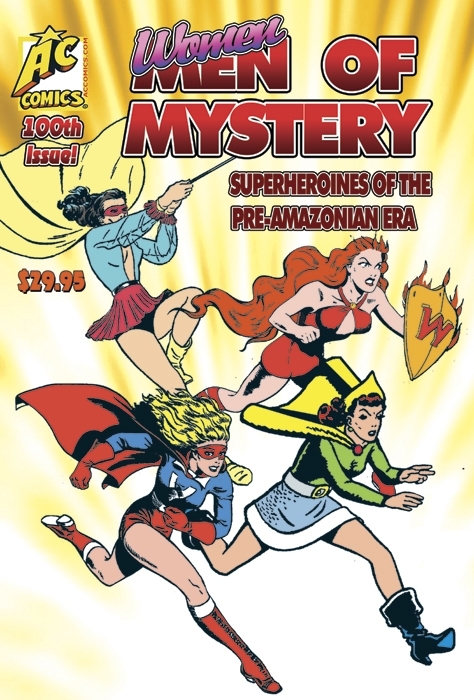 This volume covers it all, from Planet Comics one-shot AMAZONA (said to LITERALLY be the inspiration to Marston and Peter’s WW), Nedor’s WOMAN IN RED (first masked heroine anywhere in comics), from thr ultra-rare Great Comics #1, it’s MADAME STRANGE (her very first story, in it’s entirety), Centaur’s MAGICIAN FROM MARS origin (Does ANYONE else even KNOW that she was a female superheroine? With that name, probably not. ), FANTOMAH from Jungle Comics; The very LAST original Golden Age MISS VICTORY story that AC had NEVER previously reprinted; Fox Fearures’ SPIDER QUEEN; the BLUE LADY’s origin, from Amazing Man #24; CAMILLA; PAT PARKER, WAR NURSE (in the story she first dons her costume); The BLACK CAT (drawn by BOB POWELL!! ); LADY FAIRPLAY; Quality’s MISS AMERICA, USA-The SPIRIT of OLD GLORY, and WILDFIRE, all in never previously-reprinted stories; Chesler’s LADY SATAN, SORCERESS of ZOOM and QUEEN of EVIL from Fox, and even a trio of heroines that STARTED in newspaper strips (before WW’s debut) and later made their way into comics- LADY LUCK, CONNIE and The INVISIBLE SCARLET O’NEILL!! With art by Alex Blum, Dan Zolnerowich, Frank Frollo, the aforementioned Bob Powell, Klaus Nordling, Ralph Mayo, Chuck Winter, John Giunta, Malcolm Kildale, Elmer Wexler, Nick Cardy, Jim Mooney, Sol Rosen, Harry Lucey, Louis and Arturo Cazeneuve, W. B. Smith, George Appel, Maurice Gutwirth, Russell Stamm and Frank Godwin. All this plus an editorial by AC Executive Editor on the handful of qualifying heroines we COULDN’T include in this tome!! This issue has an ADDITIONAL 20 pages over even a normal huge issue of MOM, as it is a FULL 160 pages of superb classic reprints. If you think Diana Prince was the first super-female in the comic books, buy this issue and find out how WRONG you were!! Standard comic book size, fuull color covers, black and white interiors, saddle-stitched, for $29,95. Released in 2016.